Like all plants, herbs need to watered regularly, but there is a point where you can give them too much water. The effects of overwatering can be as devastating to a plant as underwatering and your herbs can die if they receive more water than they can handle. No matter which herbs you plant, it is important to avoid overwatering your herb garden. Many herbs actually like a semi-dry soil, this is true for lavender, rosemary, thyme, and many herbs that are native to the Mediterranean or other dry climates. This is great for drought years because these plants can withstand the extreme conditions. Leaves become yellow and fall. Leaves become dark or black in color. A fuzzy mildew substance is seen on the herb. Signs of edema* appear on the leaves. The herb is not growing. The herb does not appear to perk up when watered. The stems and roots soften or break easily. *Edema occurs when a plant receives more water than it can use. It will show as blisters, lesions, or indentations on the leaves. If you believe that your herbs may be receiving too much moisture, check that the drainage is adequate. Standing water will rot the roots of any plant and cause issues with bacteria, fungus, and pests. Rotted roots will turn gray or brown and become slimy. It's best to remove these plants from the garden to prevent the issue from spreading to other plants. First, be sure to plant herbs in groups based on their watering needs. This allows you to water generously in areas that require it, without overwatering herbs that like to remain dry. A good rule of thumb is to water deep and less frequently. This will promote the greatest root growth, which is what your herbs need to thrive. Ensure that all of your plants have proper drainage, this includes potted herbs. If needed, amend the soil with wood chips, straw, or a similar organic additive. Ideally, this should be done prior to planting, but it can fix an issue mid-season if you're very careful. Wait for signs that your herbs need watering instead of watering on a set schedule. Look for the plants that are just beginning to wilt or droop, then test the soil. Stick your finger an inch or two into the dirt near the plant base. If it's dry, it's time to water. Water only the root area. This will reduce evaporation and help prevent diseases caused by moisture. 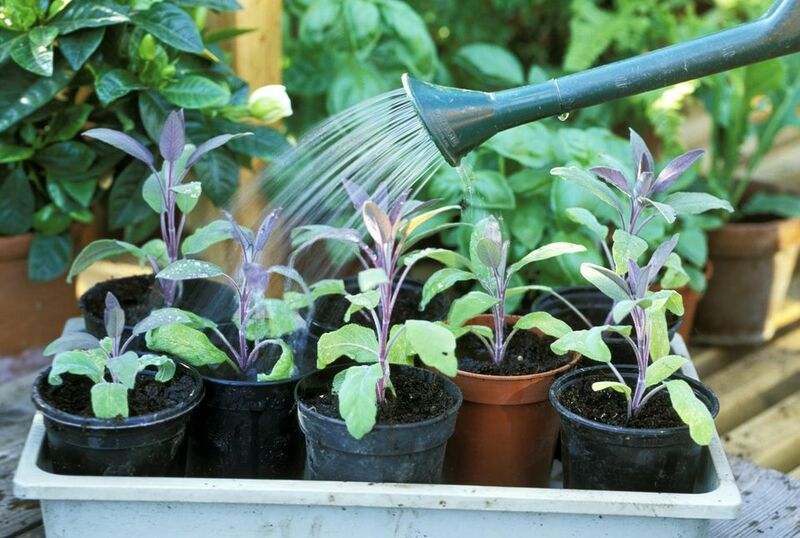 Yet, during dry and dusty weather, do give your plants a bit of a shower to clean them off and repel insects. As you gain more experience in the garden, you will learn to recognize the signs your plants are giving you. If you pay attention, a single plant can alert you to when you need to water the garden. Basil is a fantastic indicator plant because the first day that it is thirsting for water, the leaves will droop. It's very apparent and within minutes of a good watering, they will spring back to life. However, if you ignore them for too long, those precious leaves will turn yellow and be useless. Some varieties of hydrangea as well as peppers, tomatoes, and parsley can also be good plants to watch for your watering schedule.